Kaya, is a local jam made from eggs, sugar and coconut milk, and is flavoured by pandan leaves, and later sweetened with sugar. Kaya jam is a very popular spread in Singapore and Malaysia. It was originated from China in the Hainan province. The jam itself tastes sweet and is somewhat creamy, with a hint of coconut and eggs in it. Kaya is originally brown in coloured, however can be artificially coloured into a green spread. Kaya is often used as a spread in breakfast and goes fabulously well with bread that has been toasted over charcoal, and a slab of butter on it. 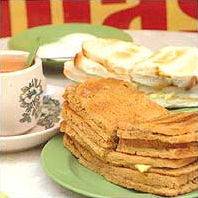 It is an increasingly popular breakfast with Singaporeans, hence the name Kaya Toast.